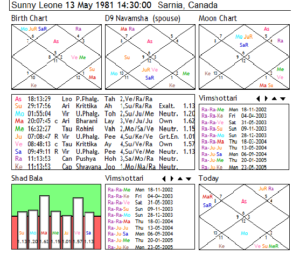 Unerring life predictions through Vedic astrology – Sunny Leone in 2016. 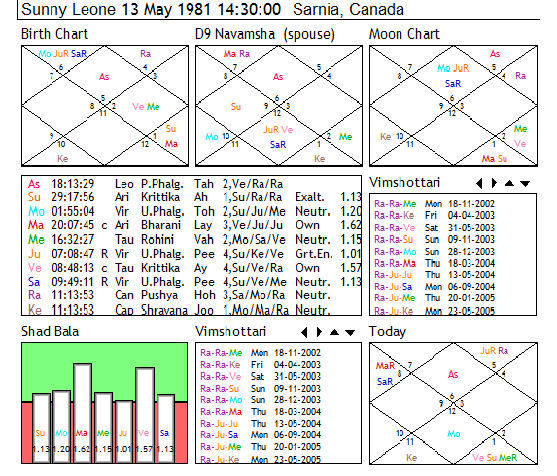 Sunny Leone is currently passing through the Major period of Rahu which runs from 14/09/2001 to 12/06/2019. Rahu is placed in the twelfth house where he removes all faith in spirituality and gives very little happiness in marriage. It forces one to seek professional success abroad. Some eye trouble also crops up during this period.In Sunny Leone birth chart, Rahu is placed in the twelfth house where he removes all faith in spirituality and gives very little happiness in marriage. It forces one to seek professional success abroad. Some eye trouble also crops up during this period. There is however a liking for poetry and literature. Rahu is placed in the twelfth house where he removes all faith in spirituality and gives very little happiness in marriage. It forces one to seek professional success abroad. Some eye trouble also crops up during this period. There is however a liking for poetry and literature.Since Rahu is placed in Moon’s sign, past fifteen years have been full of much mental turmoil. Moon and retrograde Saturn yoga in the second house also adds to mental unhappiness. The aspect of Rahu and Saturn on the fourth house is bad for parents. For Leo ascendant Mars becomes the representative of both parents. The relationship with both mother and father has suffered attrition since the beginning of Rahu Dasha and will continue until it ends in 2019. The sub period currently running is of Sun and runs from 17/01/2016 to 6/12/2016. Sun is the Lagna Lord and exalted in the ninth house. In the Navamsh chart Sun sits in the fourth house in Sagittarius which falls in the fifth house in the birth chart. The ratio of the desirable/undesirable results for Sun is highly positive. This suggests that the sun period which practically spans the whole year will prove to be very successful. Lagna Lord Sun and Yog Karak Mars form a favorable Yoga in the ninth house but there is a fly in the ointment. Yog Karak Mars is combust and low in favorable content. The personal success will also be tinged with some lack of happiness and some setbacks. Father and mother may pass through some unhappy period or bad health. The tenth house lord Venus is placed in the tenth house itself along with second and eleventh lord Mercury. Venus is strong and exalted in the Navamsh Chart. Mercury is however slightly unfavorably. Saturn aspects both planets as well as the tenth house. Career will run on an even keel but a major breakthrough may fail to materialize. Her fame however will remain high throughout. The Sun-Mars Yoga ensures good income throughout the Sun sub period. Otherwise too, Saturn is transiting the third house from Moon where he gives favorable results pertaining to earnings and enjoyment of life. Transit of Jupiter through the twelfth house until August 2016 may put obstacles in her path. Rahu transit through the twelfth house is completely without any merit. Losses due to theft and excessive expenditure can put a serious dent on financial situation. It would be difficult for her to grasp the big picture due to Jupiter-Rahu Yoga in transit. A bad judgment call can cause an arrest or something similar. The seventh lord is weak and so is the seventh house. Rahu aspects the eighth house; unhappy relationships are therefore the norm. Period from mid-June to mid-August can cause an existing relationship to fail. Hindu Vedic Astro is a perfect platform for your Health, Finances, Career options, Business success, Match Making & Marriage counseling. Call right now for step by step, simple and easy remedies that work quickly to put your life back on track.